Hi girls, I really feel lazy to change my nail color even after having so many pretty irresistible shades. Why? Actually, I don’t like the process of removing nail polish – it’s messy and time consuming. Also, after removing the nail polish the dryness is irritating. So, I usually keep reapplying the same nail paint or would apply the top coat so that the nail color does not chip. Anyways, that was my story. 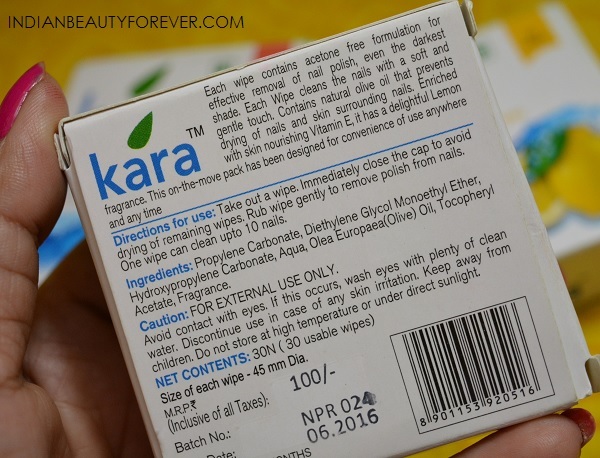 In this post, I will be reviewing the Kara Nail Polish Remover Wipes. I got these wipes along with the Kara Facial Wipes. 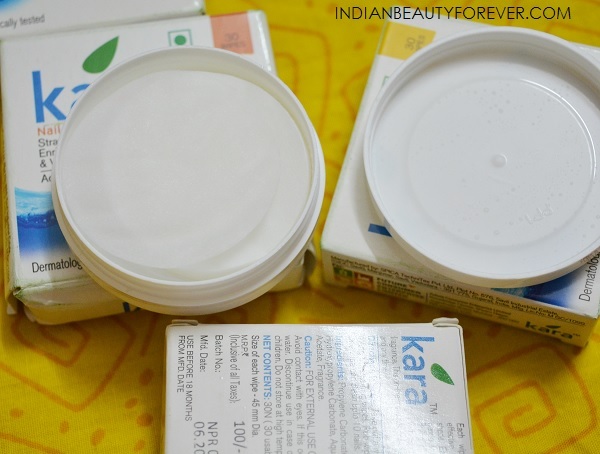 I love the Kara facial wipes and so had high expectations from the Kara Nail Polish Remover Wipes too. 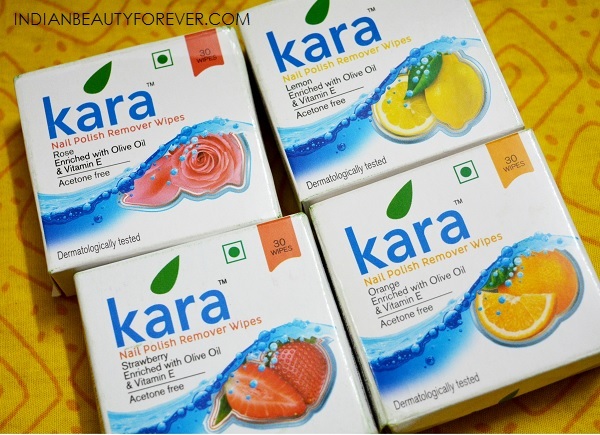 The Kara Nail Polish Remover Wipes are available in 4 variants - Rose, Lemon, Orange and Strawberry. They cost 100 rupees each for 30 wipes. They are available online - Nykaa.com and can also be purchased from BB, Health & Glow, Star Bazaar, Hypercity, Beauty stores, etc . The wipes would be around 1 and half inches in diameter. These wipes are in 4 variants and the common thing is that they all have Vitamin E and olive oil. Each variant has its own characteristic fragrance. I like all of them but my favourite are the Rose and Lemon wipes. But they all perform the same, it’s just the fragrance that varies. At first, when I saw these wipes, I was not sure how they were going to cleanse the nails and remove the old polish since they were thin and not very wide in diameter. So, I took the first wipe. It was not cool like the way we feel with the other acetone based wipe, rather it feels like a wipe dipped in light weight essential oil. I liked that feeling. I had 4 coats of nail paint and it came out with ease. I had to rub and it was a smooth process. Though the nail paint that was wiped off got around the skin of the nails as it was diluted with the oils, all I had to do was use a tissue paper to wipe it off and my nails were clean. My nails were free from the nail polish and they were not dry, unlike with the acetone based remover. For one hand, I required 1 wipe which means for one round of removal I would use 2 wipes. I think that’s fine and this entire pack of 30 wipes can last for 15 removals. Also, I tried using a single wipe for the entire 10 fingernails and surprisingly that also worked well, though slightly messy since the single wipe got drenched with the nail polish. This way I’m paying less and not getting the dryness like the acetone-based nail polish remover. Here is the used wipe. The oil base in these wipes also nourishes the cuticles of my finger nails which are good as the acetone remover can dry out the cuticles. 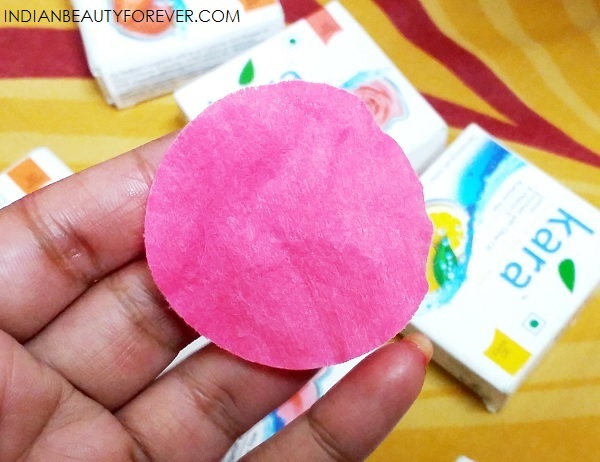 I liked the Kara Nail Polish Remover Wipes for their effectiveness. 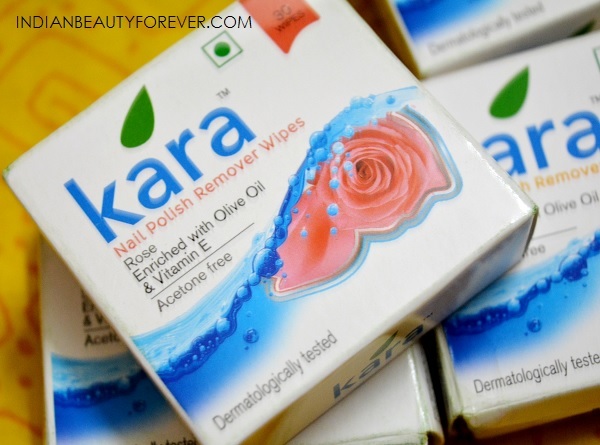 Kara Nail Polish Remover Wipes are very effective way to get rid of the nail polish, that too without the dryness and rough cuticles. The acetone-free formula is rich with olive oil and vitamin E that will nourish the nails and cuticles.